The running of day opportunities for adults with learning or physical disabilities will now be run by City College Peterborough with an emphasis on helping people to find work. The college, which is operated by Peterborough City Council at arm’s length, was chosen to run the service after concerns from residents that it would be transferred to an external provider. Let’s make sure we deliver the right service with sensitivity. The council currently runs two traditional day centres for adults under 65 with learning or physical disabilities. These are Fletton Day Centre and Kingfisher Day Centre. In addition, employment support is available from centres at 1-2 Westcombe Square, 441 Lincoln Road and 49 Lincoln Road. In December, cabinet agreed to consult on a proposal which looked to reduce the amount of time people spend in traditional leisure-based day centres. This would be by providing them with the skills to become more independent at home and in their communities and to access employment opportunities. Setting out the new proposals, cabinet member for adult social care councillor Wayne Fitzgerald admitted there were few offers to run the service. 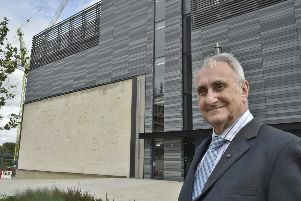 He said: “City College Peterborough expressed an interest. “The college can draw external funding because of its educational and charitable status. Cllr Sheila Scott asked whether there was a requirement for the council or the college to help people find employment. Cllr Fitzgerald replied: “The college have a track record with that. Pat Carrington, the college’s principal, said the college works with 250 employers across the city. She added that she was excited by the college’s involvement in the service and would be taking advice from other organisations. Currently the council-run day opportunities cost £1.7 million each year. The new model will generate savings in the region of £292,453 in 2015/16. Further savings of £307,547 are also expected to be achieved each year on the day opportunities commissioned by the council from the independent sector through contract negotiation. In addition, the council has also said it will invest £500,000 into facilities to help with the service. Investment will also be made in up to four new community based satellite centres which will offer people the chance to develop their independent living and employment skills. Cllr Fitzgerald added: “There are no immediate plans for the changing of staff. “There might be changes to the service as it evolves but that will be to modernise it. “If plans come forward they would have to be approved by us. “There’s always concern about change which is why it has taken so long to get here today.